All tickets include 4 days camping in your chosen campsite and access to the full weekend of festival entertainment. We do not sell day tickets. Spring Release - £179.50 - on sale now, get them here. Summer Release - to be announced. Children's tickets can only be booked with an adult ticket. More info on booking under 18's tickets here. For Boutique and Meadow Camping accommodation is not included. You cannot stay in your own tent in these campsites. You must book relevant accommodation on top of your festival ticket. 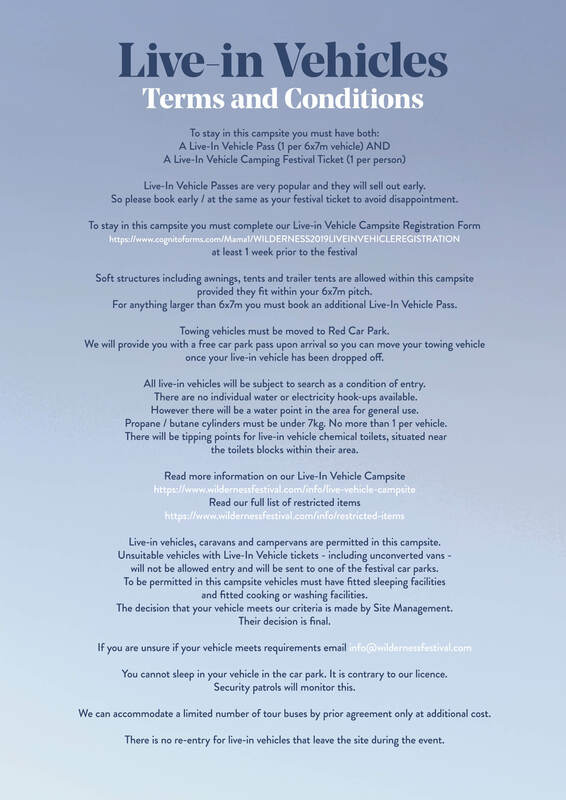 For Live-In Vehicle Camping you must book a Live-In Vehicle Pass (1 per 6x7m pitch) on top of your festival ticket. Pitches are marked out so your vehicle & any soft structures must fit within these dimensions – anything larger will require an extra pass. First things first, you need to choose your campsite. Wristbands are barcoded, so if you want to change campsites you must call up your ticket agent to do so. Alternatively bring your unworn & unused wristband to site and swap it at your preferred campsite's box office. Not camping? Just book General Camping and you can come and go as you please within our gate times, released later in the year. Then choose the number of adult tickets you would like. Under 18 tickets can be added during the booking process. If you’ll be driving, you can add on car parking passes (also available to buy on site - cash only). For Meadow or Boutique Camping you'll need to add on appropriate accommodation. Pay and make sure you receive a confirmation email. If you don't, call up your ticket agent to request one. 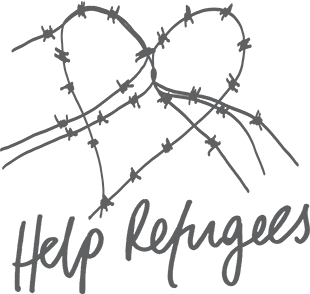 Sign up to our newsletter for important updates. Tickets are posted 2 weeks before the festival, when you will also be emailed an information pack with arrival information. Spread the cost of your festival tickets across the year. Just select Book via Deposit Scheme when you Book your Festival Tickets. If you do not complete your payment plan all previous payments will be refunded and you will have to book a new ticket at full price. So please ensure all your details remain up-to-date and that all monthly payments successfully go out. Only you can log into and access your account, so only you can make changes such as updating payment details or delivery address. When logging in you must do so exactly as you did when signing up. So, if you signed up through Facebook, log back in that way. Then you can view your account, see the status of payments and make changes. When signing up to the Payment Plan the initial deposit is taken immediately. All other payments are processed on the 1st of each month. Final payment in July. If you have missed a payment please log in to your account to check it's status and make sure all payment details are correct and up to date. If they are and the payment has still not gone out please contact your ticket agent. For Ticketmaster / Frontgate call them on 03330 035 937 . Bringing you 6 Summer Release tickets for the price of 5. That means, when you split the cost between 6, it’s only £158.08 (+ bf) each … a.k.a. one of the most cost friendly Wilderness tickets around. So, what are you waiting for? Get your friends together and get booking. Please note you must book to stay in the same campsite but you can call up your ticket agent to switch if some of you want to stay elsewhere. Teen, junior & children's tickets are not included. Wilderness is a fantastic place for under 18s. With a dedicated Family Field full of theatre, craft, workshops and nanny service and a festival programme for all ages. Begin booking your adult ticket(s) and as you go through you'll be able to add on children's. Maximum 4 children's tickets per adult. Make sure you book the right ticket for the right age of the child at the time of the festival. To upgrade a child's ticket bring the unworn, unused wristband to site and exchange it at your campsite's box office. Additional fee covering the difference in ticket cost will apply. If you've already booked adult tickets and need to add children's on, call up your ticket agent to do so. Have your order number ready when you call. You can also buy on site - subject to availability. By booking an Under 18 Ticket you are confirming you are either the parent, legal guardian or nominated guardian for the child or young person for whom you are booking. Under 18s must camp in the same campsite as their family and/or guardians. 16 and under must be accompanied by an adult over 18 years at all times. The Valley is restricted to over 18s. Boutique Camping is a stunning place to call home for four days, offering an eclectic range of accommodation for you to choose between. From Tipis to Bell Tents, Luxury Suites to Gypsy Wagons there’s something for everyone. If you don’t have both you won’t be able to access the campsite. Boutique accommodation tends to sell out, so please book both early to avoid disappointment. You or your friend already booked Boutique Accommodation? Book Boutique Camping Festival Tickets only. Don’t fancy the faff of bringing and pitching your own tent? Meadow Camping offers pre-pitched Meadow Tents and Huts, so all you need to do is arrive ready to enjoy the festival. You can only stay in this campsite if you book one of these on top of your Meadow Camping Festival Ticket. You can sleep between 2-5 people depending on accommodation chosen. Additional perks include 24-hour reception and proper loos & showers just for Meadow Campers. Meadow accommodation tends to sell out, so please make sure you book both early to avoid disappointment. New for 2019. Meadow Huts go one step further than Meadow Tents with beds and mattresses included. You'll just need to make sure you bring your sleeping bag & pillow. Vehicle must have it’s valid Live-In Vehicle Pass(es) - depending on size (1 per 6x7m pitch) - displayed before it arrives. Everyone must be sleeping in the pitch and have their own Live-In Vehicle Camping ticket. Vehicles will be directed to a pitch as they arrive, so if you'd like to stay next to someone else, it is best you arrive together. Wilderness Festival welcomes deaf and disabled guests and is working harder than ever to make the show as accessible as possible for all. We operate a 2 for 1 (free PA/carer ticket) policy for eligible guests. Available on Teen and Adult Tickets. We also have a dedicated Accessibility Campsite. This is the closest to the arena, benefiting from a dedicated car park and hard road making wheelchair access easier. Please do not book a ticket for your PA/carer as this will not be refunded if you are approved for a free ticket. Book the required number of Accessible Festival Ticket(s) (minus PA/carer). The PA ticket is provided on the expectation that your PA is willing and able to assist you throughout your visit and would be available and able to help you in the event of an evacuation. Book 2 for 1 tickets for Accessible Camping here. Book 2 for 1 tickets but stay in another campsite by choosing your preferred campsite and booking here. If you’d rather not book online, Accessible Camping Tickets can also be booked by calling our Accessible Ticketing Team on 0800 988 4440. All tickets subject to availability. Wristbands are barcoded by campsite. So, please think about which campsite you want to stay in before booking. If you need to change campsites, you must contact the ticket agent you booked through. We cannot do this for you. If you booked through Front Gate Tickets or Ticketmaster please call 03330 035 937. Have you booking number to hand when you call. Alternatively, bring your unworn and unused wristband to site and exchange it at your preferred campsite box office. If you're planning to drive or travel by motorcycle you can book Car Parking Passes in advance. Passes will also be available to buy on arrival for cash only. If you order online it will be posted to you along with your festival tickets 2 weeks before the festival. If it has not arrived within a week of the festival then please get in touch with your ticket provider. If it still does not arrive before the festival bring your order confirmation email and booker's I.D. to your campsite box office and they will provide you with a pass. They can be purchased from Larcum's Shop in Charlbury for a discounted price of £120. These are on a first come, first serve basis. Maximum 4 tickets per household. A credit / debit card, passport or driving licence with full name matching that of the utility bill. Your printed ticket, to exchange for a festival wristband at your preferred campsite box office. Proof of address and I.D. for the wristband exchange. Exchanges can be made on Thursday 1st - Sunday 4th August, within gate opening times, available nearer to the festival. Please note when you book a ticket through one of these vendors, you should call their respective customer service lines with any queries. You can call Frontgate Tickets (Ticketmaster) our main ticket agent on 03330 035 937. We do not offer refunds on festival tickets. We cannot transfer your festival tickets to future years. We do not work with any ticket re-selling websites. If you sell / give away your ticket, you will need to pass on your booking confirmation email so the new owner can call up your ticket agent to change delivery address and, if necessary, campsite. Full Terms & Conditions can be found here.